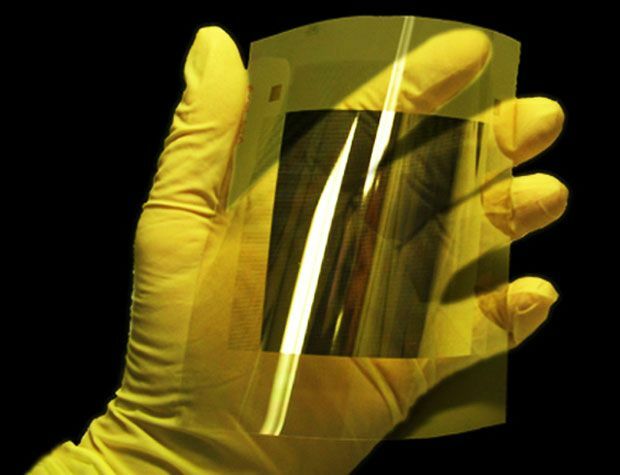 Researchers at Northwestern University’s McCormick School of Engineering have developed a graphene-based ink that could be sprayed onto substrates to make flexible electronics. While the research thus far has only extended to spraying 14-nanometer-thick layers to create precise patterns, the researchers believe that method they developed for creating the graphene-based ink could lead to flexible electronic devices in the future. Graphene’s s one atom thick, two-dimensional characteristics have been tantalizing to those interested in flexible electronics. Just last year, researchers at Cornell University performed work with graphene that suggested that circuits could be made so thin that they would be both flexible and transparent. The Cornell researchers' approach used traditional chip manufacturing processes like lithography, whereas the Northwestern team has developed a graphene-based ink that could be used for ink-jet printing of electronic circuits. This use of ink-jet printing means that the Northwestern team had to focus much of its work on finding ways of creating an ink-powder form of graphene without losing any of its attractive electrical characteristics, such as high conductivity. The research, which was initially published in the Journal of Physical Chemistry Letters (“Inkjet Printing of High Conductivity, Flexible Graphene Patterns”), yielded a method for exfoliating graphite so that it produces small bits of graphene whose electrical conductivity has not been compromised. The method can be done at room temperature using a combination of ethanol and ethyl cellulose to exfoliate the graphite. This technique, say the researchers, reduces residues and leaves a high concentration of graphene flakes that are subsequently put into a solvent, creating the ink. While the graphene-based ink leads to patterns that are 250 times as conductive as previous attempts to print graphene-based electronic patterns, the paper doesn't discuss whether the material can be engineered to act as a semiconductor. Engineering a band gap into graphene remains a critical prerequisite for applying the material in electronics, and was a preoccupation for the Cornell team in its attempts to use graphene in flexible electronics. Of course, the focus of the Northwestern team was just to find a way to extract a large amount of graphene during an exfoliation process on graphite and have the resulting material remain highly conductive. But if a method is developed that allows for the doping of the graphene ink so it can be a semiconductor as well as a conductor, we may indeed be moving towards flexible electronics made from graphene.